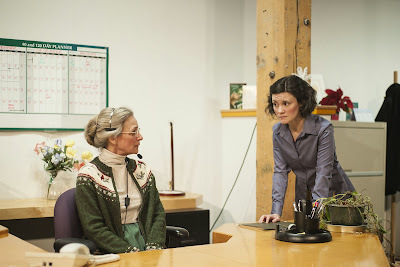 Sally Wingert (L) and Sara Marsh in "The Receptionist." This review (or a version) would normally appear in my Artscape column on MinnPost. But MinnPost is on break for the holidays, “The Receptionist” closes Jan. 4, and I won’t be writing Artscape again until Jan. 3, so I’m putting it here. You go in the front door of the Traffic Zone Center for Visual Art on 3rd Ave. N. (the strip of street facing the freeway entrance and exit at Washington Ave.) and pass through a quiet show in the lobby of delicate prints of Japanese gardens. Then you take the elevator to the fifth floor and follow the signs through a series of turns until you’re in the theater, which isn’t a theater, but an abandoned office space being used as a theater by Dark and Stormy Productions, and the set is an office. It’s already a hall of mirrors and the play hasn’t even started. The play is the regional premiere of “The Receptionist” by Adam Bock, whose work has not (to my knowledge) been presented in the Twin Cities before now. Dark and Stormy earlier introduced Bock to local audiences by giving two free readings of his plays “The Thugs” and “The Drunken City,” the first in the Casket Arts Building and the second at Mixed Blood Theater. Dark and Stormy is a new theater company and “The Receptionist” is only their third production, following the very well-reviewed presentation of Mamet’s “Speed-the-Plow” (Feb. 15 – March 9 of this year) at the Miller Bag Building and the regional premiere in 2012 of Edward Allan Baker’s “Outside Providence” at the Engine Room. D and S does not have a permanent home and uses found spaces, which adds to the unpredictability you feel when you go to see one of their performances. Directed by Benjamin McGovern, “The Receptionist” is short, just 75 minutes, and there’s no intermission. It begins with Edward Raymond (Harry Waters Jr.), one of the play’s four characters, seated in a chair on a raised platform, under a harsh light. He’s talking about fly fishing, how he loves to see the line curve out over the water, how he loves to catch fish and let them go – unless they’re hurt, in which case he kills them (humanely) and eats them. He stands up, sighs, cryptically says, “Let’s give this another try,” and exits. Lights down. It’s a puzzling prologue you set aside when the lights come back up on what will be the focus of the play: the large receptionist’s desk, run as efficiently as a cruise ship by Beverly Wilkins (the marvelous Sally Wingert). Wearing a headset, tool of her trade, she answers the phone (“Northeast Office”); converses with friends, her daughter, Jane, and her husband, Bob; counsels flirty, unlucky in love, and usually late-to-work Lorraine Taylor (the wonderful Sara Marsh); keeps jealous watch over the pens in her pen cup; orders a birthday cake for Mr. Raymond; and greets a visitor, Martin Dart (the bland yet somehow creepy Bill McCallum), who has come from the Central Office to meet with Mr. Raymond, who isn’t in yet. The play continues, and you’re charmed by Wingert’s confidence and gab, sort-of sympathetic toward Lorraine’s ineptness at managing her life, and vaguely disturbed by Mr. Dart. There’s something not quite right about his smile, his bonhomie, his small talk, his eagerness to do more than just flirt with Lorraine. As if his actions – he’s a married man, they work for the same company, they’re at the office – would have no consequences. Martin Dart is a man who doesn’t care about pushing things too far. Dart steps out for a few moments, and in his absence Mr. Raymond returns. We haven’t seen him since the fly-fishing scene. He’s agitated. Disturbed. He starts telling Beverly and Lorraine why, and here’s where I can’t say what happens next, because that would be an unforgivable spoiler. But Mr. Raymond’s words, delivered almost matter-of-factly, responded to in kind by Beverly and Lorraine – who, you suddenly realize, are all in this together – are the worm in the apple, the razor blade in the Halloween candy, the skull beneath the skin. The play is not over, but everything has changed. What used to seem banal and commonplace has been ripped open. It’s all very neatly and skillfully done. It’s also a bit of an O. Henry plot twist, minus the playfulness and moved further up in the story. I wondered briefly if this revelation were enough to justify a whole play, even one as short as 75 minutes, and decided that it is. I spent a lot of time talking about “The Receptionist” with the person I’d seen it with. I woke up thinking about it, feeling profoundly sad. It’s the holidays, so maybe you’re not in the mood for a play that makes you sad or compels you to think about serious matters, like morality, complicity, cruelty, and the central question: how can you trust anyone if you can’t trust anyone? If so, that’s fine. Don’t see “The Receptionist.” But if you’re up for something provocative and unconventional, brilliantly acted and absorbing, do. Through January 4. FMI and tickets. The final night (Jan. 4) is already sold out except for standing room.